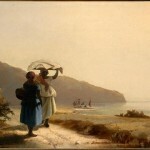 Jacob-Abraham-Camille Pissarro was born in what were the Danish West Indies in 1830. His father, Abraham Gabriel was from Portugal and his mother Rachel Manzano-Pomié from the Dominican Republic. His parents ran a dry-goods store and lived in an apartment above the store. 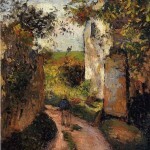 Pissarro lived with his family in St. Thomas until he was twelve and went to boarding school in Paris. In 1849, he was back in St. Thomas. He was rarely without his sketchbook and was often seen around the port sketching coconut trees, plants, donkeys and their carts, native women doing chores and other aspects of island life. He met Fritz Melbye (1826-1869), a Danish painter. 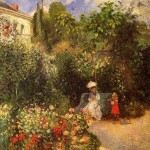 Melbye became Pissarro’s teacher and inspired him to transition from art as a hobby to art as a profession. Together they traveled to Venezuela and on to Paris. 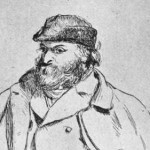 While in Paris, Pissarro studied under Jean-Baptiste-Camille Carot, Gustave Courbet and Charles-Francois Daubigny. His parents put a caretaker in charge of their business and moved to Paris. They hired a young household maid from Burgandy, Julie Vellay, whom Camille would marry. They would have eight children but only six lived to adult-hood – Lucien, Georges, Felix, Ludovic-Rodolphe, Paul Emile and a daughter Jeanne. All of the Pissarro children would themselves become painters. During the Franco-Prussian War of 1870-1871, he returned home to the islands to find his home occupied by the Prussian army. His home was used as a military butcher’s shop and many of his early works were destroyed by the soldiers who used the canvases as aprons. 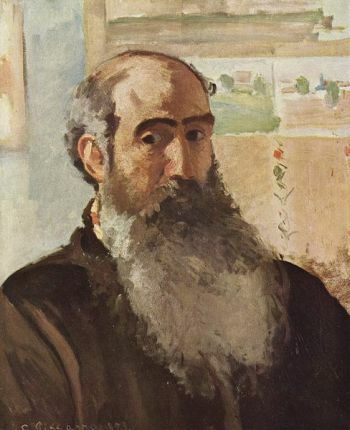 In 1874, Pissarro and Monet organized several independent exhibitions. 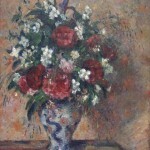 Exhibitors included Renoir, Alfred Sisley, Beliard, Guallaumin, Degas, Cezanne and Berthe Morisot. The critics loudly voiced their opposition – they saw impressionism as lacking technical detail and not accurately portraying the subject matter. 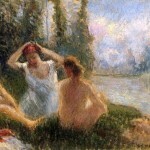 He is considered the primary developer of Impressionist technique though Monet and his work would become more well known. 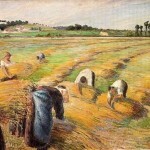 Pissarro was well-respected by his contemporaries and suffered financial difficulties throughout his career due to his steadfast support of the Impressionist movement. He did however, live long enough to see his paintings start to bring in high auction prices and his art and impressionist style become valued among younger artists. 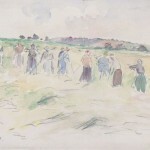 Camille Pissarro left a legacy of paintings in oil and water-colors, gouaches and pastels, thousands of sketches and drawings and a great number of etchings and lithographs. He was a self-taught artist when it came to creating etchings and created far more of the works than most of his contemporaries.